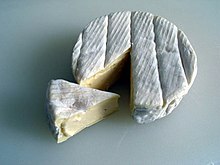 Camembert (French: [ka.mɑ̃.bɛʁ]) is a saft, creamy, surface-ripened cou's milk cheese. It wis first made in the late 18t century at Camembert, Normandy, in northren Fraunce. This page wis last eeditit on 16 Apryle 2017, at 04:34.